The WeatherFlow WINDmeters are designed to be the most accurate handheld anemometers on the market at their price point. The devices are affordable and easy to use with an intuitive mobile app. The devices were calibrated at the University of Florida's Areospace Engineering Department wind tunnel. Accuracy has been calculated to the larger of +/- 0.5% of the reading or 0.1 m/s (0.2 mph) at up to 15 degrees off-axis of the wind. The WINDmeter is able to measure winds from 1 m/s (2 mph) to 56 m/s (125 mph). Customers, such as REAL Watersports have independently reported on the accuracy of the WeatherFlow WINDmeter. 2. Ensure the WINDmeter is oriented correctly. The WINDMeter should point into the wind and should be held up as high as possible. Holding the device behind you or even beside you can create wind shadowing that results in lower wind speeds being recorded. 3. Stand in an open, unobstructed area when taking readings. Standing next to a building or structure, beneath a tree, etc., could cause variable or inaccurate readings. Note: Sometimes the actual wind speed is much less than the perceived wind speed. For instance, wind speed is a measurement of how far a mass of air travels over time. So, wind speeds are always averages. It may be that the perceived wind speed is more in line with the wind gust, which is the maximum recorded wind speed over a time period. Weather stations near you might read differently. First, recall that wind speed and direction can vary greatly only short distances apart. For instance, the winds on the beach and the winds on the water can vary substantially. So, is the fixed weather station really representative of the winds that you are measuring with your WINDmeter? Second, remember that weather stations themselves may have varying degrees of accuracy. Is the anemometer for that weather station well-calibrated and well-sited? Is it reporting the same wind speed units as your personal WINDmeter? Oftentimes, fixed anemometers will be sited at an elevation of roughly 10 m (33 feet). Hence, it is very likely to record higher wind speeds as the accompanying graphic indicates. Wind speed decreases the closer to ground you are, even when you have a clean fetch upwind of you. This decrease is due to aerodynamic forces between the air and the ground. 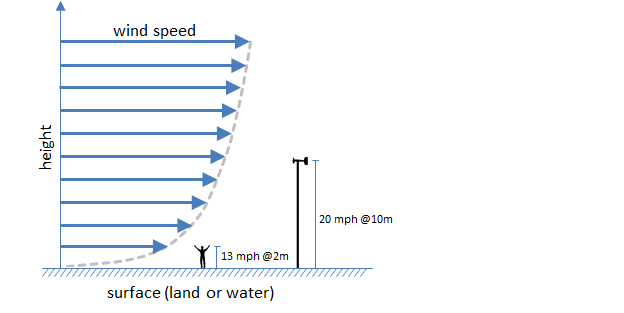 That means wind speed at 10 meters off the ground (where most anemometers are sited) is significantly higher than the wind speed at 2 meters (where you normally hold the wind meter). Our human brains automatically calibrate to this phenomenon, and any handheld wind meter will seem to read low. But it's completely normal for a handheld wind meter on the beach to read significantly lower than what your experiences over water (or what nearby weather stations may report). In case you still feel your readings are incorrect, please follow this link for WINDmeter Troubleshooting.